Like other rodents, squirrels have four front teeth that never stop growing. They never wear down, even from constant gnawing. Squirrels that get into your house eaves and attic can damage insulation and electrical wiring and should be removed. 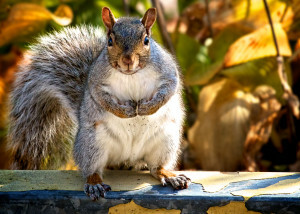 Squirrel damage ranges from contaminating your building or home with parasites, squirrel droppings and urine to ripping a hole into your soffit. Making your attic and building squirrel proof can be a permanent solution to the problem.